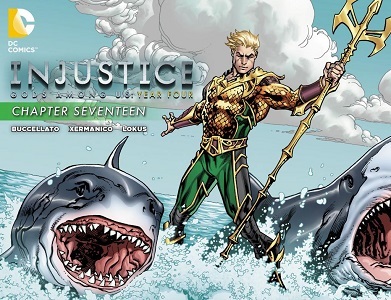 Aquaman #18 - "The Wife of Aquaman"
"Aquaman is one of the sort of big six of DC. He's not a Batman or Superman, but he's absolutely one of the first division heroes. And I've always liked him for that reason. And I like him for the same reason, I think, that I like a lot of cosmic characters, because he's not just a guy who puts on a costume — he's a guy from another world. He's a guy from Atlantis. He's not wearing a superhero costume. He's wearing royal chain mail. The success of Bombshells would be a Cinderella story if Cinderella wore motorcycle boots. The initial idea was to build a comic book inspired by a line of popular collectible figurines. 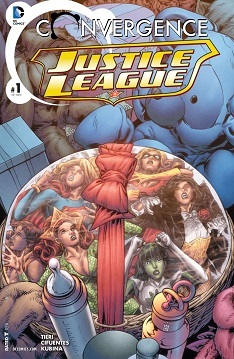 That germ of an idea has expanded into one of the brightest and funniest comics DC has to offer. The comic sold 60,000 copies in its debut print issue in August — a massive number for a digital-first comic. Women writers and artists like Bennett often face backlash for "pushing an agenda," which is usually followed up by complaints that they're ruining comics by not having women overtly sexualized in their stories. A similar backlash is also applied to nonwhite writers and nontraditional heroes. But 60,000 issues has a way of drowning out those voices. "I feel like there was a lot of resistance to that at first, but now people are like, 'The books are here, you can see what they're like, they're great. Go forth and read,'" Bennett said. "I think people are starting to understand that this is not the destruction of Western civilization if you let girls in your goddamn clubhouse." Well there's Edel Nacht AKA Brother Night who seems to be the main human in the pact with the undead Tenebrae, The Joker's Daughter who runs a cabaret in Berlin where dark rituals are practiced, and where she keeps Zatanna as her personal plaything, and three more who sum up their motivations in the latest chapter, before one of them goes toe to tentacle with Mera. 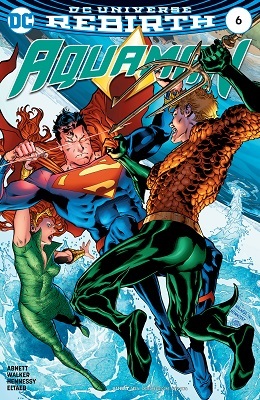 Newsarama: For the last few years, Aquaman has been in a relationship with Mera, who's often stolen the show in Aquaman stories. How important is Mera to this story? And how formidable is she as a foe for Aquaman - physically, mentally and emotionally? Bunn: Mera is vital to the series… and will become even more so as the book continues. There will be a lot of questions as to why she is out to get Aquaman. She’s the greatest single ally Arthur has ever had, and now she will become his greatest foe. She presents challenges on a physical, mental, and emotional level, and it’s fun for me to work with all three. Look to issues #44 and #45 for some major revelations when it comes to Arthur and Mera. 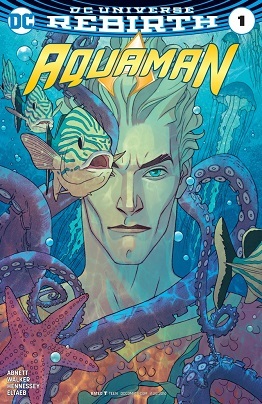 From writer Cullen Bunn and artist Trevor McCarthy, we have a new Aquaman run. I'm a bit hit or miss when it comes to Bunn's work (love Sinestro and Fearless Defenders, but most of his Deadpool stuff and Magneto leaves me a bit cold), but hey, he's teamed up with an artist I really like. So let's see what we get to look forward to with his upcoming run in this sneak peek. Well, that's it from me! Feel free to comment and add your own.